Dreams are worth chasing! That is the wisdom from life coach and motivational speaker Tom Ingrassia. A long-time client of North Forty Road, we recently helped Tom’s MotivAct Group launch a new web site to showcase his unique brand of mentoring and coaching for success. We are pleased to host the MotivAct Group at North Forty Road. Tom is able to share stories of the people he has touched, bits of wisdom and inspiration, and even videos of new talks and programs. His itinerary is maintained online so that people can come out and see him live and in person. The WordPress engine gives him the power to update his site on his terms, while our custom theme gives it a look all its own. 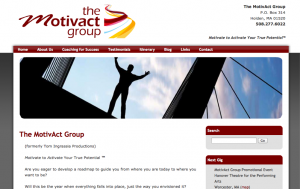 Check it out at www.motivactgroup.com. ← New Website. New Partner.